Madeleine Sorapure, Director of the Writing Program, displays a poster promoting the new Journalism Certificate Program. Madeleine Sorapure, Director of the Writing Program, is among the faculty that made the Journalism Certificate program possible. In a recent interview, she shed light on the reasons behind the program and what it entails. 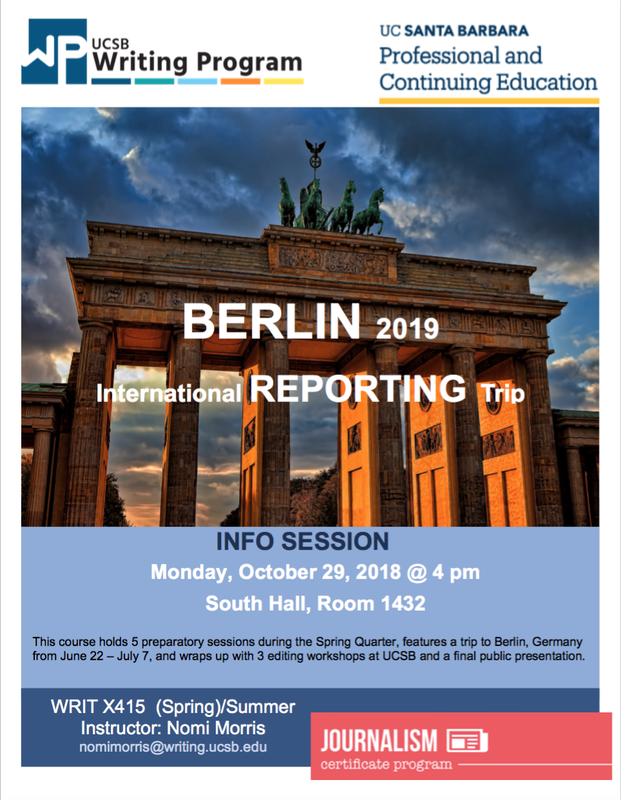 She also describes a new course in the program that has attracted student interest: International Reporting, taught by Lecturer Nomi Morris, will take students to Berlin in June of 2019. Among your other titles, you are also Chair of the Journalism Committee. What is the Journalism Committee? It’s a committee of Writing Program faculty and UCSB Professional & Continuing Education faculty, essentially those who are teaching in the Journalism Certificate program. I’m not teaching in the certificate program, but I’m chairing the committee just because I wanted to help get the program started. What drove faculty to create a new program when there are other specialized writing programs already established on campus? What about this program is unique? It was really a matter of recognizing the student interest. There are so many students involved in The Bottom Line, The Daily Nexus, the radio station, The Independent and various magazines around town, doing a lot of extracurricular journalism, and we assumed they might be interested in a certificate program in journalism. I would also say it’s a general recognition of the importance of journalism in contemporary society. Now, more than ever, it seems that students are interested in becoming journalists and pursuing news and pursuing the truth. Many people recognize it as a career with a valuable mission. Is the Journalism Certificate an official document that is recognized in the professional world? It’s a certificate that you can put on your resume. UCSB has other certificate programs, like Business Administration, and the idea is that these are professional programs as opposed to academic programs, and designed for people in the community as well as for students at UCSB who want to get a professional certification in a specific area. Pictured: Gwendolyn Wu, who graduated in 2018. TMP, that’s the Technology Management Program, has been a great model. They offer a certificate program for undergraduates on technology management and that’s been very successful. We decided to go with a certificate rather than a minor in large part because of the TMP, and the model that it provided, and also because having a professional certificate seems to be a valuable thing for someone who wants to move forward in journalism. What kinds of classes does the Journalism Certificate require? This is a certificate program, which is different from a major or a minor. UCSB departments don’t give certificates, they only do majors and minors, so in order to develop a certificate program we had to work with Professional & Continuing Education. Some of the courses are in the Writing Program, and some of the courses are in Professional & Continuing Education. I know one of the Extension courses is the International Reporting course which will head to Berlin this Summer. Where do you think this class will take students in years to come? I think the International Reporting professor, Nomi Morris, is interested in going to other countries. Cuba is something that she had mentioned, and I think she might have mentioned Israel. She has a lot of experience in international journalism—that’s her area of expertise. So, whatever she thinks would be the best place for her to go, I think that’s where they’ll go. What makes the International Reporting course so groundbreaking for UCSB? What about the Journalism Certificate program in general? There’s EAP (Education Abroad Program), but we’ve never had an International Reporting course at UCSB. I believe UC Berkley has a graduate journalism program and a summer program minor. But I’m doubtful that any UC campus would have an international reporting trip for undergraduates. So that’s pretty exciting! And my understanding is that for the Journalism Certificate as a whole, we are the only campus in the UC System that has something like this designed for our own undergraduates. What other courses are offered through Professional and Continuing Education, in addition to International Reporting? So far, we have three other courses in PaCE (formerly Extension). The first is Visual Journalism. That’s a two-unit course focusing on photography and video, and generally the tools that journalists need to present stories visually. The second course is Data-driven Journalism, which is a really important area of current journalism to help students use data and visually represent data as they are conveying news stories. And then the third course is Entrepreneurial Journalism, and that’s going to be a course where students learn about professional strategies for moving forward in the field of journalism. They’ll also hear from local journalists who will come and visit the class and speak about journalism as a career. We may develop additional courses in the future on different aspects of journalistic writing, but for now those are the four that we have. You can see that the three other ones are not really that similar to the International Reporting course in the sense that they’re here at UCSB and they’re all two-unit courses. But they’re all great courses, so you can’t go wrong. Is there an application to get into the Journalism Certificate program? No, you just need to take the required courses. We recognize now that the program is starting that there may be some seniors who would love to be in the program and are kind of rushing to put it all together. But generally we’re going to be offering the courses regularly, so you would just need to make sure to take the introductory course, the concluding capstone course, and then the courses in between in the Writing Program and Professional and Continuing Education. And then you have to register with Continuing and Professional Education and pay a fee, to get started. Will any scholarships be offered? Yes. We have some funds to give scholarships to students for the Certificate program as a whole. Of course, they could use those funds for the International Reporting course or for the other Extension courses, because although the Writing Program courses are paid for by their tuition and fees, they have to pay a little bit extra to take the courses in Professional & Continuing Education. We realized this may be a burden for students who are already stretched financially, so we came up with funds for scholarships to help students offset these costs. As the co-director of the Multimedia Communications track within the Writing Minor, you know that the internet has opened a lot of platforms for journalism, so how does the Journalism Certificate program cater to this shift in journalism? Most of our journalism courses incorporate digital and social media. The Data-driven Journalism course has to do with the internet and using digital tools as well as finding data on the internet that helps convey a news story. With Visual Journalism, you know, visual and video reporting is really important and is driven by the internet and digital technologies. I’m pretty sure Janet Mizrahi is going to ask students to create an electronic portfolio at the end of her course, which is the capstone course, Writing 128. They’ll create portfolios of their work and have an online presence as journalists, and that’s really to recognized that, professionally, to be successful you need to know how to get your information out on the internet and social media. Skyler DePaoli is a Fourth-year Sociology major with a minor in Professional Writing.